The great trifecta of the board sports brought into one. The Deus Powder Tools Pike Snowboard brings you the flow and playfulness of a fish style surfboard with the response of your skateboard. With an arc tail design that's roomy enough for switch stance, spins and massive bank turns -- you're headed for some seriously good times on this special board. Directional Pow Camber  Large rocker profile in front to keep your from catching an edge with camber under foot to maximize stability and control. Freestyle Fish  Based off of a fish surfboard, this board is shorter and more stout to give you the best turns and carves possible. Poplar Wood and Bamboo Mix  Top of the line materials to give you the response and playfulness you need on the mountain. ABS Sidewalls  Acrylonitrile Butadiene Styrene sidewalls for extra strength and pop throughout the board. Powder Powder snowboards love powder. 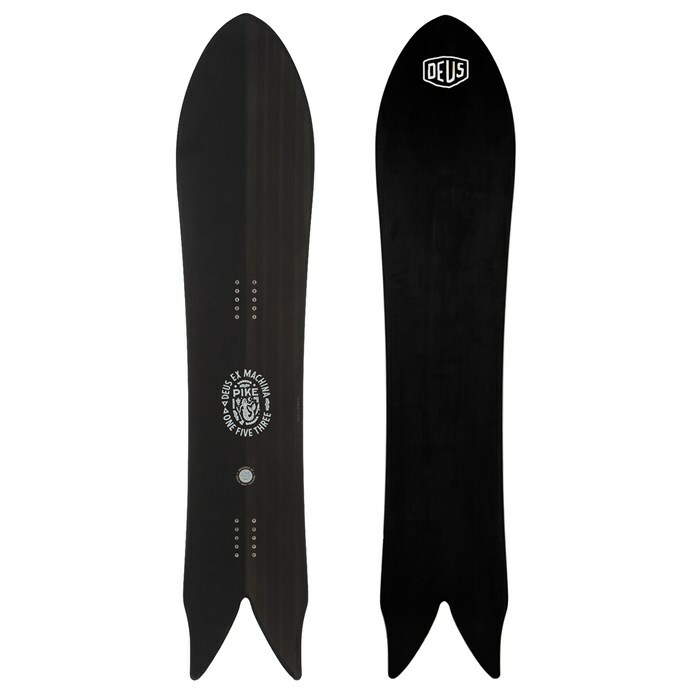 Often associated with freeride snowboards, powder boards sometimes feature a wider nose and a tapered narrower tail. The binding inserts, which determine the rider's stance, are often set back on a powder snowboard to help the rider float the tip of the board through the deep stuff. Powder snowboards sometimes also feature rocker, a design element where the tip (and tail) rise starts farther back on the board, which also helps the rider maintain tip float through the pow.